It’s already November, which means the snow will start flying soon. For those last minute consumers out there scrambling at used car dealers in Albany, NY to try and find a car to drive through the snow that isn’t your convertible — or if your car just decided to finally call it quits — you’re probably wondering what to get. Do you need a truck or SUV to survive the winter? Is AWD or 4×4 capability the way to go? Are those heated seats really worth the extra grand for that used car with the higher trim? I’m here to sort this out (and more) so that you can make a successful purchase for the upcoming winter season. Here’s what you’re prospective used car needs to survive the inevitable snow that’s about to set in on us. When it comes to winter driving, you’ll hear a lot of people toss around the value of having 4×4 and AWD, which begs the question: which one is better? 4×4 is typically found on SUVs and pickup trucks, and (in a nutshell) sends power to all four wheels when the system is engaged. Having all four wheels spinning as opposed to two is extremely helpful for traction, and also pulling yourself out of any deep snow that might bog down one of your back tires. AWD (all-wheel drive) is like FWD or RWD. Instead of being engaged — although it sometimes is — it’s present all the time. The only downside to this is the loss in fuel economy compared to a RWD or FWD vehicle. It means at all times, power is going to all four wheels. Since it’s typically found on sedans and crossovers, it doesn’t have the capacity to pack nearly the same punch as 4×4 capability does. So, what’s the verdict? The answer is both are viable, and it all boils down to which one you prefer to drive. If you want something for going through anything and everything Father Winter throws at you, then a truck or SUV with 4×4 capability is recommended. If you need something to commute to and from work in the winter, AWD is going to work perfectly fine on that sedan or crossover you buy. Therefore, it’s not necessarily a question of what system is more superior. Rather, it’s what do you need to get out of your used car or truck this coming winter. Think about what you’ll be using it for in the winter — and the conditions you’ll be in — and pick accordingly. Typically, you’ll see used or new car buying guides that are all about making sure you aren’t paying for anything you don’t need, like heated mirrors, or some type of rust prevention sealer for the undercarriage. While some of this stuff is completely worthless, it’s a whole different story when winter hits. Don’t get me wrong, the rust preventer and other useless add-ons are still not worth having. But, the winter packages and features that come on higher trim-level models? Those are entirely worth it for winter-wonderland driving — if you can afford them. Winter is a miserable time of year, especially when you’re on the road. You have to trudge outside ten minutes earlier than usual to ensure your car warms up sufficiently, and then drive through a bleak landscape on your commute to work, traversing potentially hazardous road conditions. Therefore, don’t look at those extra winter features like a waste of money: look at them as a great way to boost your spirit this season, and make your winter driving just a little more special. If you can afford it, why not shoot for a higher trim level? In the used car market, you’ll still be getting a great deal when it comes to the price, especially when compared to the same model and trim found in 2016 at a brand new MSRP. Grab that remote car starter for your used vehicle if it’s available. That way, you can start your car in the morning from the warmth and comfort of your home. If heated mirrors are an option, grab those to make your life easier as well. Heated seats do wonders in cold weather, and feel awesome when heading to work after an extra early morning of shoveling snow out of your driveway. The point is if you can afford it, go for it. Typically, saving money is the goal of used car buying, but winter can be so miserable for commuting, that even something as simple as being able to start your car with the push of a button will start your day off right. If you really want a bargain for this winter, grab a vehicle that has snow tires and all-weather tires already on it and ready to go. Tires are expensive, and snow tires are even more expensive. Therefore, if you can get them rolled into the price of the used car, then go for it. You’ll have to buy some anyway since warm-weather tires won’t cut it when the snow starts swirling. Even with AWD or 4×4 capability on board, warm-weather tires just don’t have the grip or tread necessary to survive snowy and slippery roads. While electronic stability control (ESC), airbags, and a safety cage are all required on any cars that are produced nowadays, you can find some used vehicles that have extra safety features already included. Again, if you have the money and want to be extra safe in the winter, don’t be afraid to buy a used car that has optional safety features added. Some of them might be beneficial for winter driving, such as lane keep assist, or a rear back up camera with rear cross traffic alert when you can’t see past the gigantic snowbanks that you got stuck parking between. Adaptive cruise control could be helpful as well, and any used cars that have ABS brakes are always welcome. Then again, it will probably cost you a little more to find a vehicle like this, considering some of these are relatively new safety features. But, if you do want to grab one from 2010-2015, might as well make sure you’re getting the best buy possible, right? 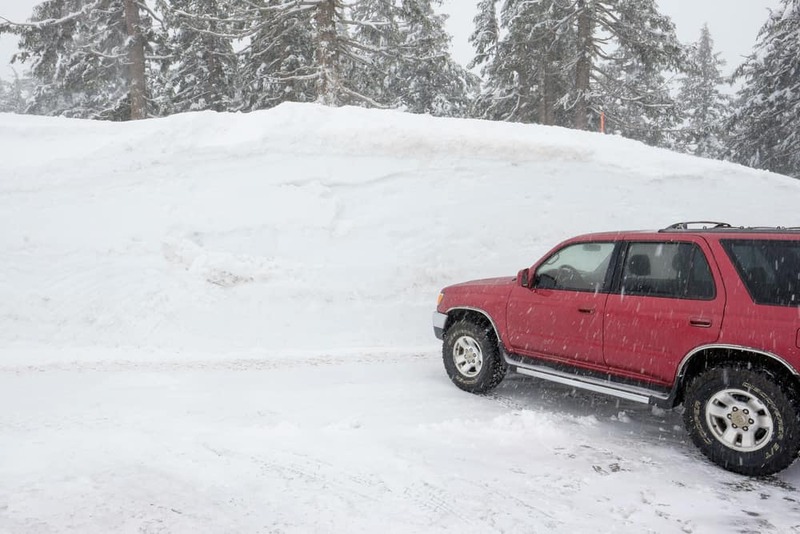 While there’s plenty more to consider, even just buying yourself a used car that has snow tires already equipped, some extra winter-comfort features, and 4×4 or AWD capability will ensure that you and your ride make it safely through the snowy season.